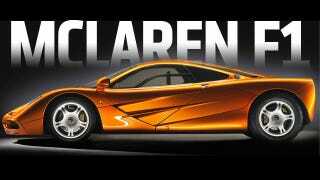 McLaren P1 Vs. McLaren F1: How Do They Match Up? So you know how you were thinking about going out and buying a used McLaren F1 and a brand new McLaren P1 so you could park them side-by-side and really scrutinize the differences? Well, you're in luck, because I'm going to save you about $2.5 million dollars or so, thanks to Jalopnik's amazing new Dynaslide Image Comparitorization System (DICS) technology. As you can see, the new P1 pretty significantly updates the McLaren look, perhaps most dramatically in the way the less-sloping C-pillar emphasizes the car's cab-forward/rear-mid engine layout. The detailing is significantly cleaned up and updated to a more modern design vocabulary, and the blacked-out intaglio surfaces give the profile a dramatic, graphical look. The front and rear treatments are also significantly updated, as you can see in the sliders below. Both ends have shed their somewhat parts-bin feeling lights and indicators, and now sport units that flow seamlessly into the liquid, flowing contours of the body. The front and rear treatment of the old F1 have arguably been the car's weaker spots, styling-wise, and the new P1 makes a pretty dramatic improvement. I'm convinced. As soon as the wagon version comes out, I'm totally getting one. Or maybe the pickup. Click here to play with the front-quarter view slider. Slide to compare the P1 and F1. Go ahead! Click here to play with the rear-quarter view slider.